It takes a special blend of musical flair to create memorable songs of yesteryear! Songs with a hint of contemporary-dosed with uncontrolled laughter, deep-rooted couplets and sudden, impromptu shifts - that speak to familiar rhythms of the past. 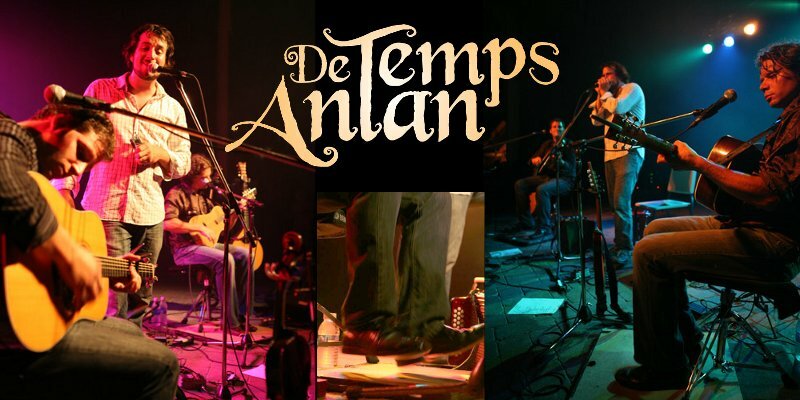 Welcome to the original musical stylings of De Temps Antan! Since 2003, Éric Beaudry, André Brunet and Pierre-Luc Dupuis have been exploring and performing time-honoured melodies from the stomping grounds of Quebec&apos;s musical past. Using fiddle, accordion, harmonica, guitar, bouzouki and a number of other instruments, our three virtuosos blend boundless energy with the unmistakable joie de vivre found only in traditional Quebec music. In fact, the only thing missing from this magnificent musical blend is you! So come enjoy an evening unlike any other with De Temps Antan! ANDRÉ BRUNET was born in Lacolle, in Quebec's Montérégie region. Growing up, it was his parents who first noticed his keen interest in music and encouraged him to follow his passion. André's first love was for the violin and, at the age of nine, he began taking lessons. Along with brother Réjean, he created Les Frères Brunet and went on to record several albums and perform at various concerts around the world. In 1997, André's unwavering energy and refined style earned him a spot with La Bottine Souriante, with whom he toured more than 15 countries over the course of 10 years. Although his journey with La Bottine Souriante came to an end in 2006, André remained immersed in traditional music. At the Grand Masters Fiddling Competition in August 2008 - an event showcasing more than twenty violinists from across Canada - André took home top honours as "Grand Master of Canada". It was the first time a Quebecer had won the prestigious award since the competition's inception in 1990. 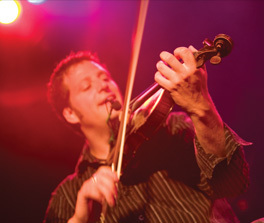 Whether he's accompanying his wife Martine Billette for a piano duet, or playing alongside fiddle stylists Kevin Burke (Ireland), Christian Lemaître (Brittany) and Ged Foley of Celtic Fiddle Festival, André feels right at home on any stage. Today, his passion for traditional Quebec music continues to pave the way for dance and swing enthusiasts the world over - a true journey of musical discovery. PIERRE-LUC DUPUIS was born in Louiseville, in Quebec's Mauricie region, and hails from a lineage where traditional music was always at the forefront of daily life. Although he began singing with his family at a very young age, Pierre-Luc was somewhat of a late musical bloomer, taking up the accordion at 18! But what he lacked in experience he made up for in determination. 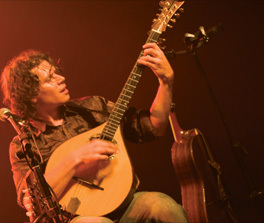 At 19, he founded Les Langues Fourchures, with whom he recorded his first album in 2001. For the next 4 years, he helped the band pay its dues and make its mark throughout Quebec and, in 2003, he joined La Bottine Souriante, one of the province's best-known music groups. Since then, he's wowed audiences from Dublin to Porto and Budapest to Melbourne with his unique humour and warmhearted charisma. Since ending his journey with La Bottine Souriante in 2008, Pierre-Luc has devoted himself to his true love - De Temps Antan. 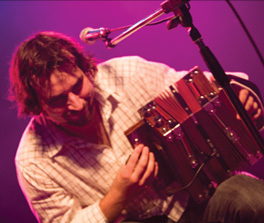 ÉRIC BEAUDRY was first exposed to traditional Quebec music in Saint-Côme, a village in Quebec's Lanaudière region. Raised by a family entrenched in music, he began singing and playing guitar at the age of 10. In 1992, he unleashed his musical ambitions on local audiences by founding La Galvaude, followed-up later by Ni Sarpe Ni Branche and Norouet. Éric's passion for music also helped foster an interest in song, which led to several awards including a 2002 Prix Mnèmo for his role in producing the album Musique gaspèsienne, featuring violinist Édouard Richard. In 2003, hot on the heels of this success, Éric became a member of La Bottine Souriante. Éric's love of music also spurred a passion for enlightening others and, following the completion of a Bachelor of Arts in pop guitar and jazz, Éric began teaching traditional music at Joliette's CEGEP règional de Lanaudière in 2002. Wherever he performs, Éric's rich vocal range and unquestionable talent on stringed instruments - guitar, mandolin and bouzouki - guarantee a rousing performance for all.